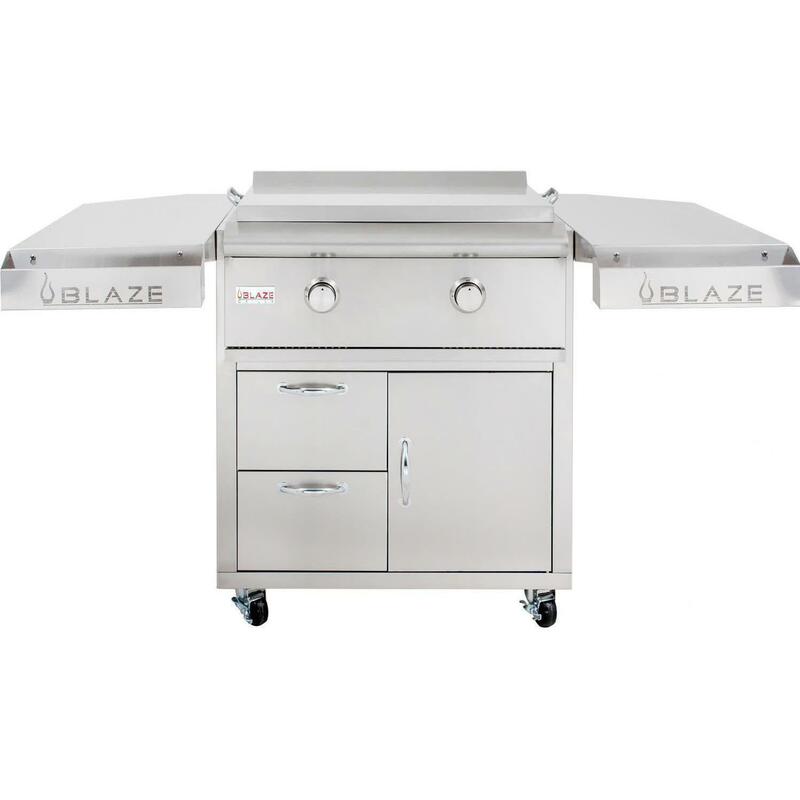 Product Description: Blaze 30-Inch Freestanding Natural Gas Griddle On Deluxe Cart. The freestanding griddle from Blaze is designed to take outdoor entertaining to a new level. The amazing versatility of the Blaze griddle allows you to cook up bacon and eggs, juicy hamburgers or sizzling fajitas with rice and veggies for the whole family. 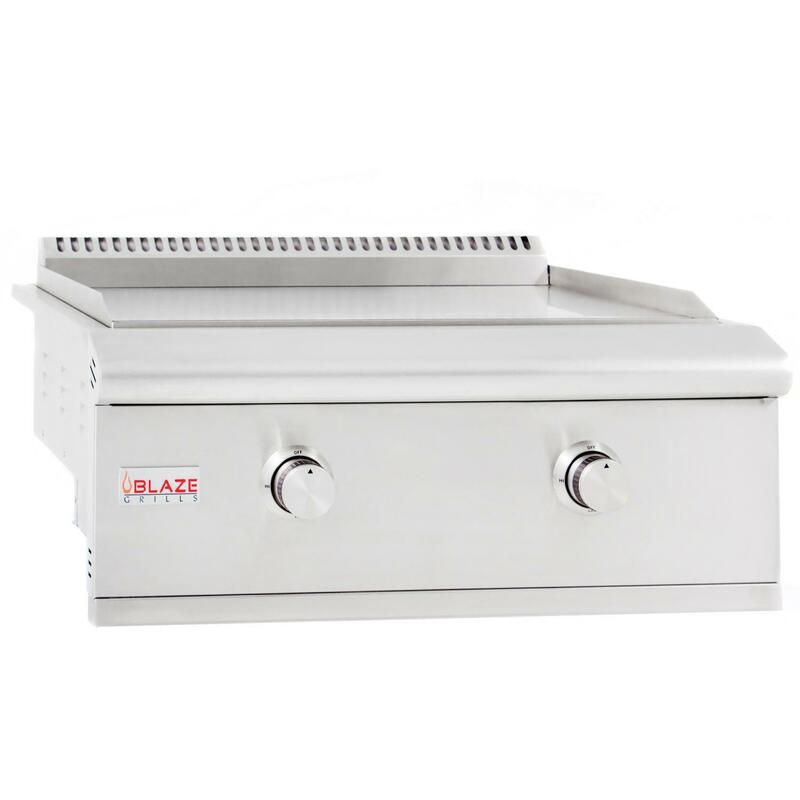 This Blaze natural gas griddle is equipped with two commercial quality, 304 stainless steel U-shaped burners that each deliver 18,000 BTUs of cooking power for a total of 36,000 BTUs across the 495 square inch stainless steel cooking surface. Push and turn flame-thrower primary ignition, backup flash tube secondary ignition and cross tubes ensure a steady, reliable flame with every start. A large capacity grease trough with a hole in the center directs grease down to the drip tray below for easy cleaning. This freestanding griddle is constructed entirely from heavy-duty. 304 grade stainless steel for outstanding durability. 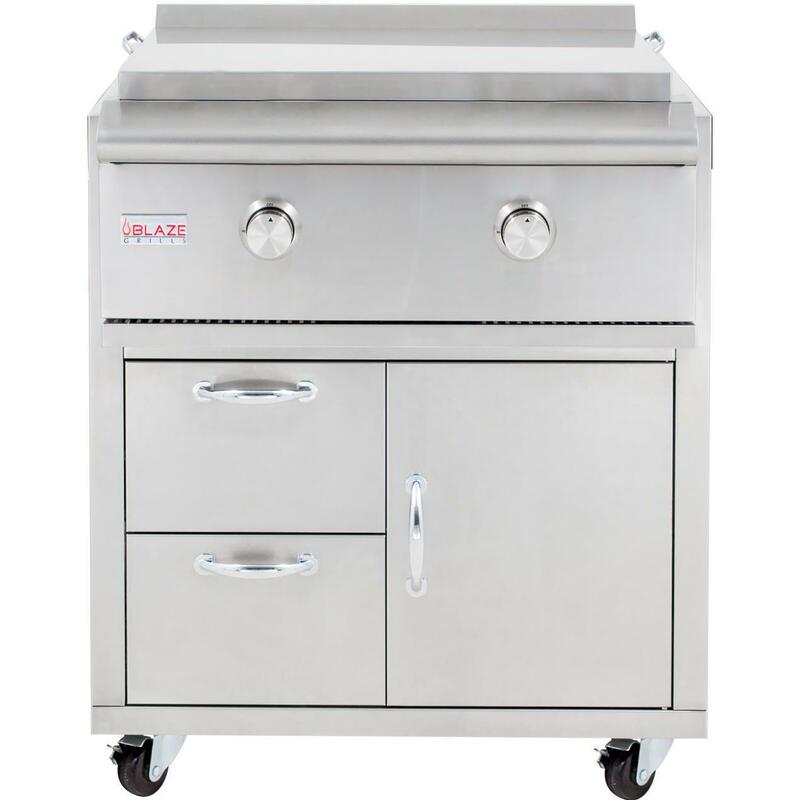 The deluxe cart features a two drawers for storing grilling accessories and one large door for storing oversized accessories or a garbage can. While you are using the griddle, you can store the griddle lid behind the cart on the storage bracket. The bottom drawer includes a tray with seven individual, removable containers for keeping veggies or condiments conveniently nearby. The insulated drawer can be filled with ice to keep food chilled. It is also equipped with a drain for easy ice removal. The removable condiment racks on each shelf keep your favorite sauces and marinades within reach while cooking, and the side tables make entertaining a breeze, giving your guests room to eat and enjoy your delicious outdoor cooking. For added convenience, the shelf has a built-in cutting board. The cart moves around easily on heavy-duty casters so you can move it around on the patio while entertaining. The Blaze freestanding griddle also carries an ETL certification.